Document TCM Services the Right Way. 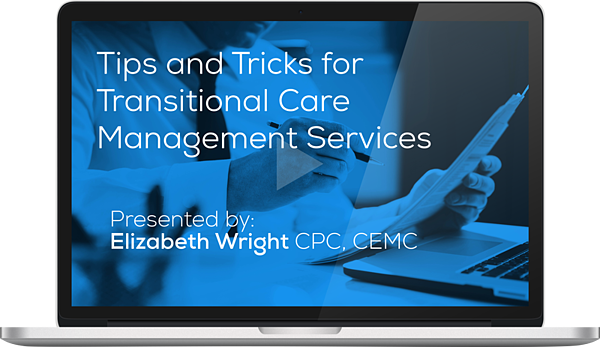 Do you know the requirements for billing Transitional Care Management (TCM)? Well don’t panic, it’s easier than you think. In this webinar, we answer nearly all the questions you’ve ever had about coding and documenting TCM services. Like, which services can be reported in the 30-day period defined by TCM services, and which ones cannot. Plus, we clarify which carriers will reimburse for the service, and the distinct roles of your TCM providers, because without a team-based approach, TCM services could fail to prevent readmission. Filling out the form below will allow you to watch the on-demand webinar for free. On the next page you will have the option to purchase a CEU for $30. PLEASE NOTE: This program meets AAPC guidelines for 1.0 CEU. This can be split between Core A, CEMC, CDEO, CPCO, CPMA and CPC. You will receive your CEU in a separate email after attending the live webinar or watching the on-demand recording.